On Tuesday, the U.S. Track and Field and Cross Country Coaches Association announced that Central Arizona College sophomore Eldred Henry, is the 2015 National Jr. College’s Field Athlete of the Year, following up on the Premier Dental Collegiate Athlete of the Year honors he earned during the BVI Athletics Association gala. On Friday, Henry won the 2015 National Jr. College’s Indoor Championships Shot Put crown, then finished second in the 35-pounds Weight Throw on Saturday, earning All America honors in both events. Twin sister teammates Trevia and Tynelle Gumbs were second and eight respectively in their Shot Put competition, with Trevia earning All America honors, marking the second time two BVI athletes have earned the feat in any level of Collegiate competition. On his third throw of the Shot, Henry—who went into the championships as the top seed with a 20.00m mark—hit a 19m measurement for the first time with his 19.08m winner. Henry rose to the occasion again in the Weight Throw—his first season trying the event. Ranked in the top 10 coming in, he unearthed a twirl of 17.97m (58’11½”) to finish second, destroying his previous best of 16.84m (55’3”) in the process. Dougherty said the Weight Throw isn’t an event Henry practices much but was doing it to get team points to help win the championship. Henry was a little upset Dougherty noted because he had heard too many people didn’t think he had thrown the shot that far and said he’s going to come back and wing the Weight Throw. Henry has earned three All America honors in his two Jr. College Championships after winning the Discus Throw outdoors last year. Trevia, who entered the meet ranked No. 2 in the Shot Put, met one of her goals—beating Jamaica’s Glenvieve Grange of New Mexico Jr. College with whom she has battled at the Carifta Games—but had to settle for second with a 14.59m mark behind Iowa Central’s Janeah Stewart’s 14.71 fourth round winner. Grange—who had the top mark entering the meet—placed fourth. Tynelle was eight to score a point with her opening 12.74 effort. In the 20-pounds Weight Throw, Tynelle—who entered the competition in pole position with an 18.14m throw (59’6½”)—was plagued by foul trouble and settled for sixth place with an opening heave of 15.91m (52’2½”)—her lowest mark of the season. 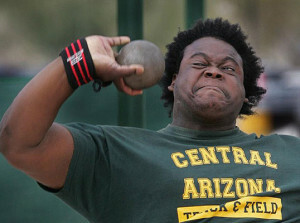 Central Arizona women finished fifth in the championships with 57 points while the men were second with 116.